So the other night I couldn't sleep, and was wide awake at 2am. I got up to get a drink, then returned to bed and tossed and turned until I finally got comfortable. As I was laying there trying to fall asleep I started to hear this faint rustling noise coming from the corner near my nightstand. I tried to ignore it, telling myself that it was my imagination....but it continued. I have a stack of papers and magazines in that corner, so of course my imagination started running! I won't go through the list of things I imagined, but the bottom line is something was there moving around and I need to know what it was! Mind you, this need to know what it was has nothing to do with me figuring it out.....no way, that has to be a job for my husband. There is NO WAY I am going near that corner and pulling stuff out! I am officially boycotting that corner. The only problem is that it's very close to my side of the bed, and every night since then it's all I can think about as I lay there trying to go to sleep! Sorry, I'll move on to food now and hopefully I will forget about the corner for a while! 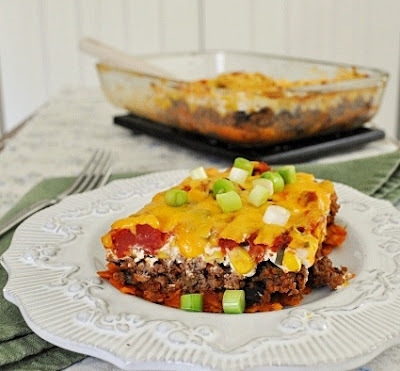 Taco casserole - another favorite of ours. I, of course, love one dish meals. Nothing better on a weeknight. I like tacos, I guess, but I do prefer a taco salad to regular tacos. I don't know why, it's just something about those shells. For some reason I don't like the shells! I think that's why this dish appeals to me so much - I get all the taco fixings without having to put it into a shell. I have a tendency to add vegetables to casseroles because, to me, it's just not a one dish meal without it! So, even though most people don't put corn in their tacos, I just had to add it. This dish is pretty versatile. You can change it up to include your personal favorite taco toppings....really, you can get pretty creative here. The possibilities are endless! Preheat oven to 350, and spray a 11 x 7 pan with cooking spray. In a large skillet, cook beef until no longer pink and drain off any excess fat. Add the chili powder & cumin and stir until well combined. Add 1 cup of salsa and the beans, reduce heat and simmer for 15 minutes. Spread crushed chips into bottom of baking dish. Layer the beef on top of the chips, then sprinkle the corn over the beef. Spread the sour cream over the corn. Add the remaining salsa on top of the sour cream and then sprinkle on the scallions. 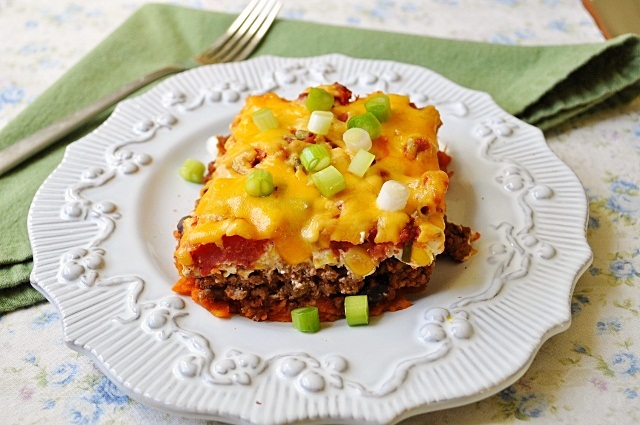 Top with the cheddar cheese and bake for 30 minutes or until bubbly. This looks so yummy, I will be trying this soon! Thanks for sharing with us!!!! What was in the corner? ?